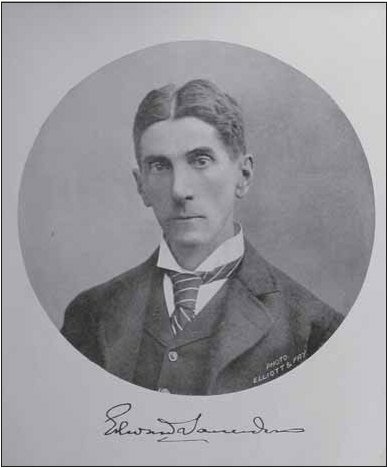 Edward Saunders was born at East Hill, Wandsworth on March 22 1848. His father was W.W. Saunders, who for a time, held a commission in the British Army (Royal Engineers). Young Edward was educated entirely at home and began an interest in natural history at an early age, beginning with the Coleoptera, though he also studied both botany and conchology. In 1864, when sixteen years old, he published his first paper, “Coleoptera at Lowestoft” in the Entomologist’s Monthly Magazine. Later, he began a very detailed study of the world Buprestidae, culminating in his Catalogus Buprestidarum Synonymicus et Systematicus. Other papers on this family were published between 1867 and 1873. In the course of this work he visited many European museums to study their collections of this family (especially the types). This was his only visit to foreign countries, with the exception of a later visit to Brittany. He described several new genera and more than a hundred new species of these beetles. His collection of these magnificent beetles was donated to the British Museum in 1874 (consisting of 7,267 specimens, of which 364 were types). In later life, he became well known for his interests in both Hemiptera-Heteroptera and the Hymenoptera Aculeata. He wrote numerous papers and short notes on both groups. One of his most important papers was his Synopsis of the British Hymenoptera (with drawings by his brother G.S. Saunders) which appeared in three parts in the Transactions of the Entomological Society of London (1880-1884). In addition, he published two important volumes: Hemiptera-Heteroptera of the British Islands (1892) and The Hymenoptera Aculeata of the British Islands (1896). Both books were published by L. Reeve & Co., London, and each was produced in a cheaper, non-illustrated edition and a more expensive, illustrated one. Indeed, the illustrated edition of the Hymenoptera-Aculeata remains an extremely scarce and very expensive book (as might be expected for the period, the numerous whole insect illustrations were all hand-coloured). For more than a century this publication has been the only book to contain keys for the identification of all British bees though, of course, it is now well out of date. In addition to the keys, there are detailed descriptions of each species, together with brief details of their distributions within the British Isles. He and Morice also published an annotated list of the aculeates of Surrey in the Victoria County History in 1902, which is a useful benchmark for later recorders. Other of his publications contained descriptions of new species of aculeates from southern Europe and North Africa, based on material collected by his various acquaintances. Saunders’ interest in the aculeates was perhaps the result of his father having acquired the collection of W.E. Shuckard, with which he would have been familiar in his early home life. Also, both he and his father were friendly with F. Smith (who was employed to work on the Hymenoptera collections at the British Museum) and a number of other well known aculeate hymenopterists, such as Rev. A.E. Eaton, Commander J.J. Walker and Dr. Chapman (T.A. Chapman?). His father’s cousin was Sir S. S. Saunders (Consul-General in Albania), who formed an important collection of aculeates from the eastern Mediterranean region. In 1865 he followed his father into Lloyds. He married Miss M.A. Brown of Wandsworth and they had a large family. His profession and the demands of family life strictly limited his time for collecting and writing (he never collected or described species on Sundays). As a result, much of his fieldwork took place locally in Surrey and while on holiday (mainly on the south coast of England, although there were visits to the Channel Islands and Brittany). Nearly all his important papers deal largely with the structure and systematics of Aculeata, rather than their habits, life histories and distributions. He became a Fellow of the Entomological Society of London in 1865 (and served as both Treasurer and Vice-President), a Fellow of the Linnean Society in 1869, and was elected a Fellow of the Royal Society in 1902 (for services to Systematic Entomology). As a result of his work in London, he lived at various addresses close to the capital: Reigate, Wandsworth, Bromley and, finally, Woking. While in Woking, he occupied St. Ann’s in Mount Hermon Road (south-west of the railway station), though the house no longer survives. He presumably chose Woking because of the fast train service to London and because it was surrounded by heathland. He collected mainly on nearby Chobham Common and Horsell Common, which was then known as Woking Heath, especially the entomologically famous sand pit there which still exists today. This sand pit is also famous as the place on which the Martians landed in ‘The War of the Worlds’, by another well-known Woking resident, H.G. Wells. He died, probably of complications following influenza the previous year, in seaside lodgings at Bognor Regis, West Sussex, on February 6th 1910.